you might think that the ancient Egyptians make such a fuss over the afterlife and death. The truth is, they really were very much into living. They lived a life full of ceremony, study, beautification and artistic pursuits. They were so ecstatic about living that they cannot conceive of permanent death, or not being alive again right after dying. Thus the Egyptian worldview consisted primarily of rebirth, resurrection and the otherworld, where one went right after expiring in the physical world. Perhaps that is why they turned death into such an elaborate ceremony that included the very painstaking process of mummification. They believed that to preserve the body was also to preserve the soul and spirit within necessary for one's journey to the otherworld. The Egyptians were aware that an individual is composed of a body, a spirit and a soul. They might have believed that these three were not separable judging from their hieroglyphs, rituals and mummies. The earliest evidence of a mummification process was traced to around 3600 BCE. An Egyptian's titles were recorded on a stele, which also included a list of the offerings that he or she would like to receive after death. 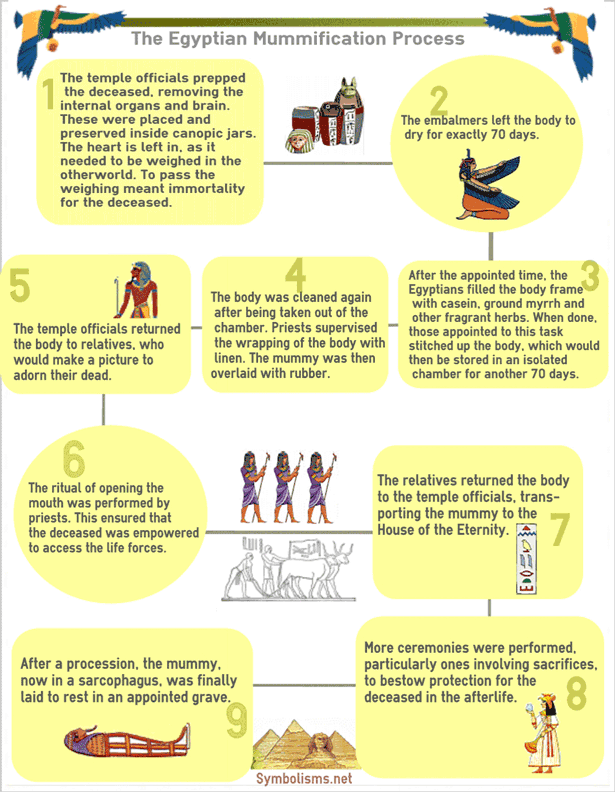 The infographics below shows what are involved in the very complex ritual that is mummification. of rebirth may have come from their observation and understanding of the cycles of nature. They studied the life cycles of plants and the precise movements of the sun and moon in the sky, of night and day. They considered death as a temporary state prior to rebirth. The god of the dead and the underworld was Osiris. He was also a god of vegetation and so was often portrayed as having green skin. In most cases, Osiris is portrayed as a mummy wearing the white crown of Upper Egypt. He was the god king who is also the symbol for fertility and rebirth. The afterlife can be entered by anyone who performed good deeds and was fair to everyone while alive in the physical world. Previously only the pharaoh can become a god in the afterlife. When the Old Kingdom ended, the deceased commoner was also given the funeral rituals of the pharaohs so that he or she can be reborn as Osiris in the next world. That was perhaps why the Egyptians regard any work or preoccupation as deserving of respect. Contrary to some early historians telling of Egyptian slavemasters, the ancient Egyptians likely did not practice slavery. There are existing murals depicting what seemed like cruelty to workers, but records of owning slaves are few and far between. They did not even have a word for slave, slavery or ownership of slaves. Neither did they consider all their pharaohs of divine birth. They did not worship their pharaohs like a god. Only Amenhotep III and Hatshepsut were depicted as being descended from the gods. Every Egyptian was expected to do his job to the best of his ability, be he king or carpenter. If one failed at his appointed task or chosen work, he had created chaos, according to ancient Egyptian beliefs. Ka or spiritual energy. The ka of a deceased must be constantly nourished with food offerings for its journey in the otherworld. Ba or the physical body. The ba enabled the deceased to move and walk in the afterlife. Akh or the transformed spirit. The akh merged the ka and ba to bestow the deceased with sufficient power to undergo rebirth and live forever. The ancient Egyptians understood the existence of a universal creative energy and divine power in nature. They devised rituals and spells to ensure prosperity through abundant crops, safety in childbirth, protection against illness and healing of injuries. They had household gods that they can depend on. The gods who offered daily wisdom and protection included Bes, Taweret and Thoth. The typical ancient Egyptian home was bedecked with statuettes of gods and goddesses as well as their images. The Egyptian was usually wearing an amulet, wand and charms that bestowed protection and luck. His amulet may contain rolled papyri with spells of protection. back then. It is in keeping with the ancient people's belief that every action is inherently divine. Learn more about the magical Egyptian symbols and their meanings by clicking this way! You might also want to read my articles about the pyramids, Egyptian hieroglyphs or about ancient Egypt. OR Click to return from Mummification (this page) to the Symbolisms homepage.